This incredibly valuable investigative reporting. I have excerpted a few of the sections I found most interesting but the entire article is worth a good read, and I look forward to future segments in this series. I use StatsCan and other data frequently and generally find I can find what I need, or an alternate way to identity issues and trends. So I do have some sympathy for StatsCan Head Anora’s comments that sometimes researchers don’t try hard enough (e.g., see my critique of Karen Robson: Why won’t Canada collect data on race and student success?, weak to non-existent municipal diversity statistics can be found in census occupation group data). But the example of birth statistics is where I cam up short. The vital statistics agencies do not capture visible minority data or accurate residency data, and do not verify identity documents of the parents. All of which mean, in addition to the all important health-related differences, that births to non-residents are drastically undercounted by StatsCan (in the end, I found better if imperfect numbers from hospital financial statistics: Hospital stats show birth tourism rising in major cities). And yet, in fields ranging from public health to energy economics to the labour force to the status of children with disabilities, there’s a lot that Canada simply doesn’t know about itself. What Mr. Wheeler doesn’t mention, but is hard not to notice, is the number of data gaps that threaten to undermine policies the government of Justin Trudeau has put a lot of stock in – policies meant to address such issues as sexual abuse, the settlement of refugees and improving the lot of Indigenous Canadians. “Good policy is impossible without good data,” said Finance Minister Bill Morneau in a 2016 speech. But this government’s trademark policies often don’t have good data behind them. 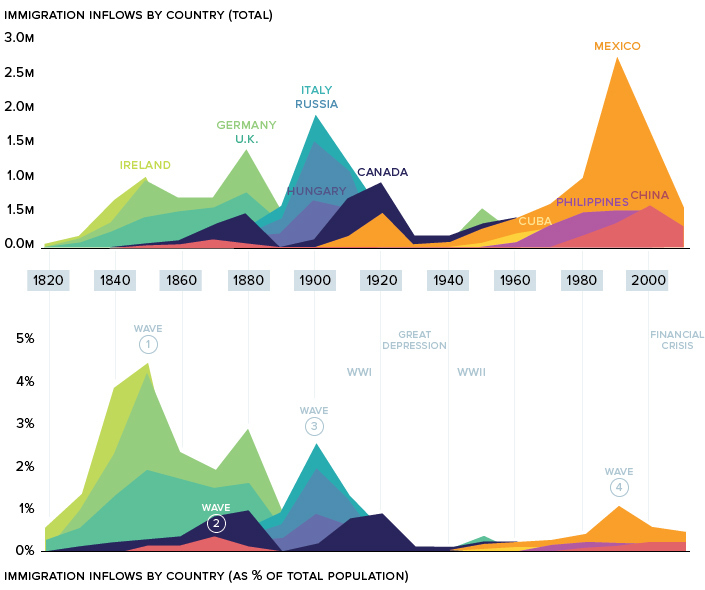 Instead, Americans are world leaders at gathering and sharing an abundance of national numbers. “The U.S. has awesome data on almost everything,” says Jennifer Winter, director of energy and the environment at the University of Calgary school of public policy. Source: The cost of Canada’s data deficit When it comes to basic data about its own citizens – from divorce rates to driving patterns to labour trends – Canada simply doesn’t have the answers. If information is power, this country has a big problem. President Trump has frequently called the situation at the southern border with Mexico a crisis and insists that building his long-promised border wall will fix it. Here are some of Mr. Trump’s most common assertions of a crisis, and the reality of what we know about immigrants and the border. 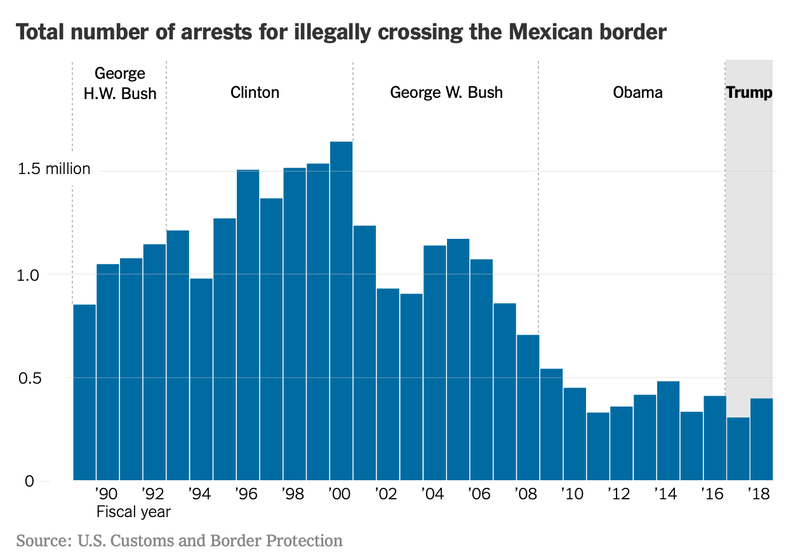 THE REALITY Illegal border crossings have been declining for nearly two decades. In 2017, border-crossing apprehensions were at their lowest point since 1971. 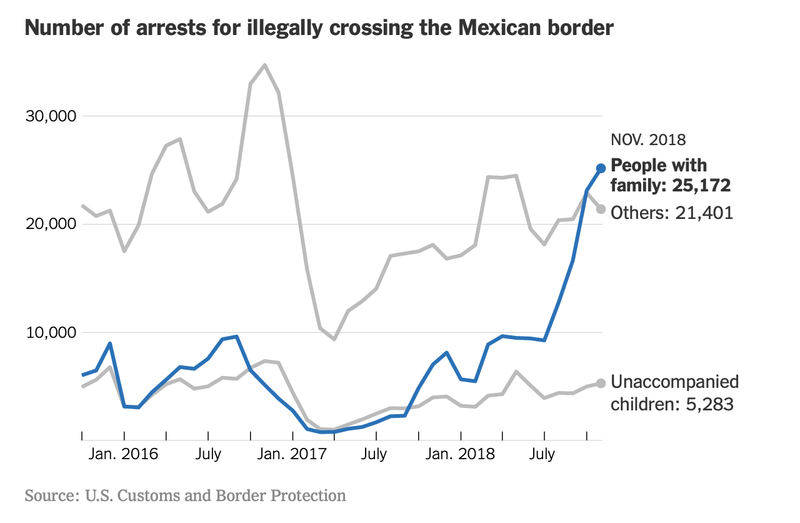 Asylum claims have also jumped, with many migrant families telling officials that they fear returning to their home countries. Seeking asylum is one way to legally migrate to the United States, but only 21 percent of asylum claims were granted in 2018, and many cases can take years to be resolved. THE REALITY It is true that the majority of heroin enters the United States through the southern border, according to the Drug Enforcement Administration. But the D.E.A. also saysthat most heroin is brought into the country in vehicles entering through legal border crossings, not through the areas where walls are proposed or already exist. There are more than two dozen ports of entry along the southern border. Barriers are already present in Border Patrol sectors with the highest volumes of heroin seizures. THE REALITY It is difficult to assess the president’s claims that illegal immigration leads to more crime because few law enforcement agencies release crime data that includes immigration status. However, several studies have found no link between immigration and crime, and some have found lower crime rates among immigrants. Texas, which has the longest border with Mexico and has one of the largest populations of undocumented immigrants of any state, keeps track of immigration status as part of its crime data. 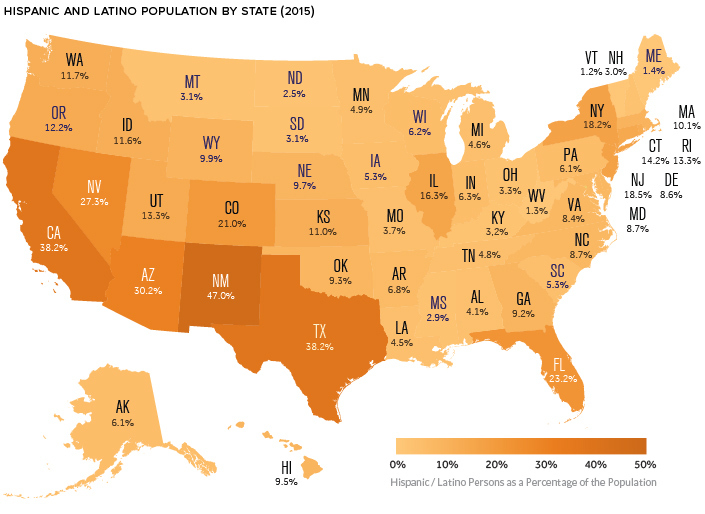 The Cato Institute, a libertarian research center, analyzed the Texas data in a 2015 study and found that the rate of crime among undocumented immigrants was generally lower than among native-born Americans. Some critics of the study argued that the reason undocumented immigrant conviction rates were low was because immigrants were deported after they served their sentences, which prevented them from committing another crime in the United States, reducing their rate of crime relative to native-born Americans. President Trump frequently tells the stories of Americans who have been killed by undocumented immigrants as examples of criminal behavior. These terrible crimes have happened, but there is no comprehensive data that shows whether these killings are happening at crisis levels. Source: Trump Claims There Is a Crisis at the Border. 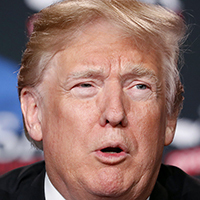 What’s the Reality?Here are some of President Trump’s most common assertions of a crisis, and the reality of what we know. Karen Robson: Why won’t Canada collect data on race and student success? While I always favour more data to better understand the differences in outcomes between groups, I am puzzled by the assertions regarding data gaps made by Karen Robson in her recent opinion piece. First, the OECD PISA study includes both first generation children, born abroad, and the second generation, born in the destination country, where issues related to racism and discrimination can be separated out more clearly from more basic integration issues (e.g., language fluency). 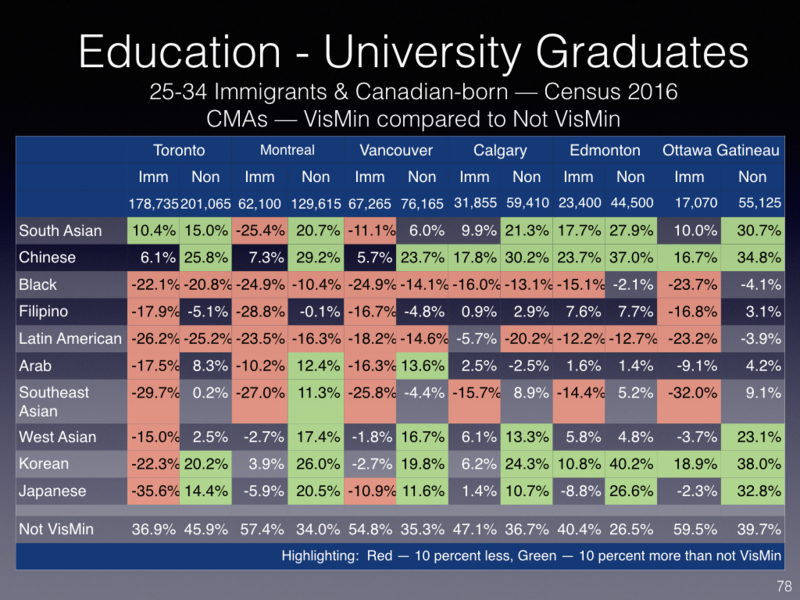 Secondly, while the visible minority category may not be perfect, it does provide a race-based breakdown in the Census with respect to education, along with other economic and social outcomes, which can be used to provide municipal level data at the census tract level. Toronto school board data uses largely comparable categories. Ironically, the same pattern she cites with respect to Toronto, where the school board collects race-based data, can be seen nation-wide: Asian and South Asian students with stronger outcomes, Black and Latino weaker ones. Her academic article (journals.sfu.ca/cjhe/index.php…), on which this op-ed is based, doesn’t make these mistakes and is a comprehensive and interesting study of Toronto District School Board data. But her arguments that the lack of comparable data to Toronto across the country is a significant data gap is less convincing. Although the impact of income inequality and gender on education outcomes is much discussed in Canadian government-level policy debates, factors of race and racism are seldom measured or addressed. However, as an education researcher comparing student outcomes in Toronto, Vancouver, New York, Chicago and London, I can see Canada’s policy-makers have a big knowledge gap because they don’t deal with or have access to information regarding race. In Canada, we have a tendency to focus exclusively on whether a student comes from immigrant parents. I believe this focus is problematic. In a country grappling with the heritage of colonialism, the success of immigrant children comes as good news to share and promote. 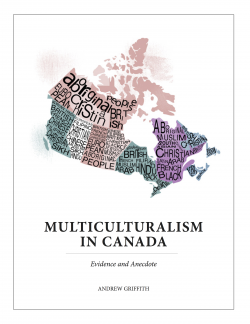 This success can be interpreted as a sign that multiculturalism has been successful, that racism is not a barrier to education attainment and that immigrants are treated equally and have the same opportunities as children born in Canada. This is not to discount the work that teachers and schools do to integrate, educate and welcome students of immigrants; my point is that there are some reasons that such children who already speak an official language may be doing better than immigrants who arrive as refugees in another immigrant receiving country, like Sweden. Focusing on the success of immigrants detracts from the problem of how systemic racism contributes to inequality in educational experiences and outcomes. Another common misconception is that race and immigrant status are equated; of course they are not the same thing. In response to research demonstrating a gap between Indigenous and non-Indigenous student outcomes in Canada, a Canadian think-tank reports that some provinces have pledged to begin asking Indigenous students attending mainstream schools to self-identify when provinces collect their PISA data. No known similar move is afoot, however, with regards to collecting data about racialized students or their income levels. Basically, this means comparisons are made between white and non-white people. 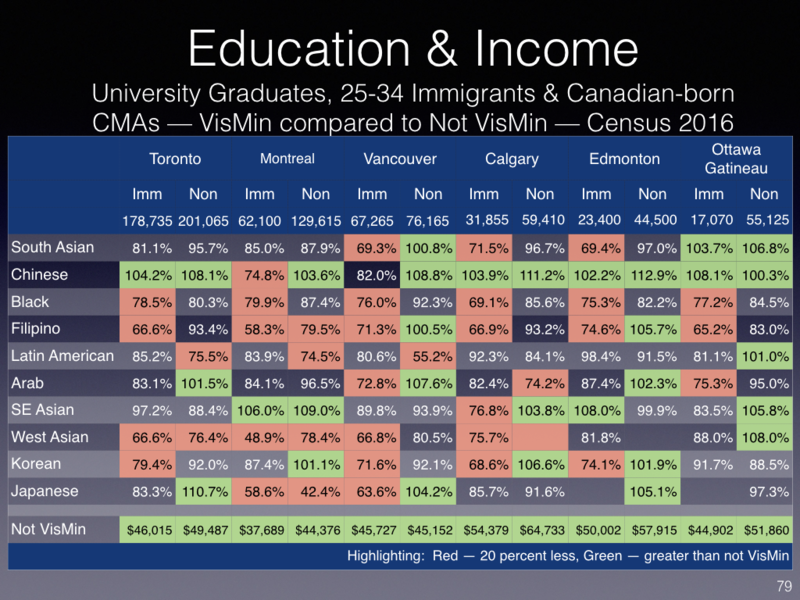 This comparison happens even in areas like Toronto where “visible minorities” make up more than half of the population, making whites in fact, a minority. Further, the data tells us nothing about poverty by postal code. 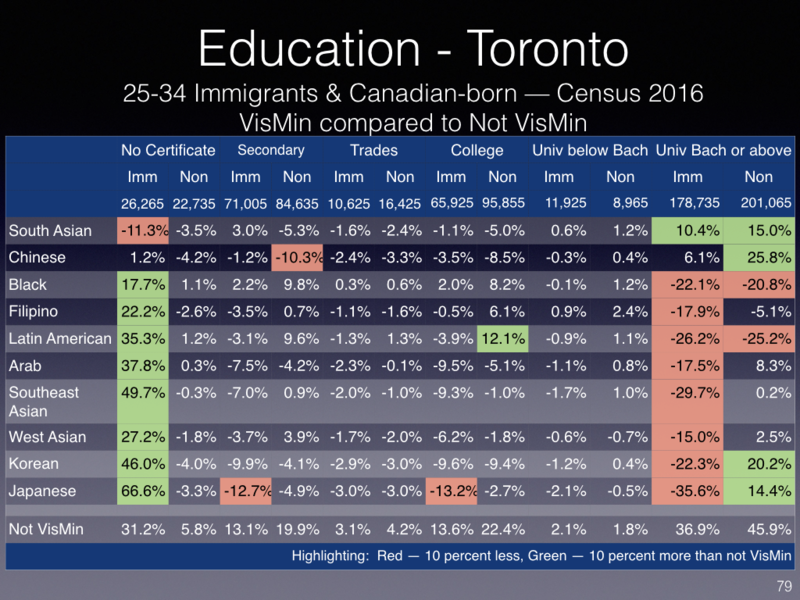 In Toronto, where we do have data, the figures show that Asian and South Asian students trend toward having high marks and are more likely to go on to university. Black and Latino students trend toward lower grades and are more likely to be placed in the “applied” stream of high school courses (which are not eligible for university). Source: Karen Robson: Why won’t Canada collect data on race and student success? The provincial government will begin collecting and analyzing data on the ethnicity of students in an attempt to improve school achievement, CBC News has learned. The move will be announced today by Education Minister Mitzie Hunter as just one part of the province’s new equity action plan, according to a government source. The decision to gather demographic data such as race and ethnicity and to analyze its relation to school achievement will help the government make better education policies, said the source. Word of the decision comes just as students across the province return to the classroom — and after complaints of discrimination and racism made headlines during the past school year. In April, Hunter issued a sweeping list of directives to the York Region District School Board after two high-profile incidents of racism and Islamophobia within the YRDSB: one in which a school trustee used a racial slur when referring to a black parent, and another in which a principal posted offensive material on Islam and refugees to her Facebook page. Those two incidents were set against a backdrop of mounting complaints of systemic racism in the board. That was followed by the YRDSB thanking the ministry for the report, albeit pointing out it contained “significant errors of fact,” and making assurances it would take action immediately. A report out of York University found that a similar phenomenon reverberated across the Greater Toronto Area, with black students routinely being streamed into applied programs rather than academic ones, and suspended at much higher rates than their counterparts. Led by professor Carl James, the study made several recommendations which the TDSB said it would review. And in June, an investigation into allegations that a high school teacher in Whitby, Ont., referred to a group of black students with a derogatory term using the N-word with no punishment for the teacher, according to a parent who attended a meeting with the Durham District School Board. School boards across Ontario should collect comprehensive data on their students’ race, ethnicity, religion and gender identity, a new report by York University urges. This demographic data could help educators make learning more inclusive, from tackling systemic racism to designing lessons relevant to all students’ experiences, says the report, commissioned by the Ontario Ministry of Education. “If you want to be able to work with particular groups of students, you should know who they are, otherwise you might be putting (resources) where they’re not addressing the issues directly, and that doesn’t help,” said Carl James, a York University education professor and co-author of the report. The Toronto District School Boards collects information on student backgrounds through a census produced every five years. Data collected in those surveys has helped show that Black students are twice as likely to be suspended from school and twice as likely to be enrolled in “non-academic” courses compared with other students. The Peel District School Board has said it plans to collect race-based data through its own student census, expected to launch in 2018. The York report’s call for improved data collection falls in line with the province’s three-year plan to battle systemic racism, unveiled in March. Legislation expected to be tabled as part of this plan would make race-based data collection mandatory in Ontario’s education, child welfare, health and justice systems. School boards across the province can improve upon the data they already have by requesting demographic information on students’ registration forms, James said. “Right now, the long-form census does collect race data, so it’s not something that’s beyond what we collect in Canada,” he added. The York report called for school boards to improve their demographic data collection no later than 2018-2019. The tracking of racial, religious or ethnic information has garnered criticism in the past, from people concerned it can be used to profile or single out a particular race, particularly if the information is collected by police. But race-based data can be an extremely positive step, as long as it is collected and used responsibly, said Anthony Morgan, a lawyer who specializes in issues of racial justice. James acknowledged that the topic of race-based data could cause discomfort in some people. But race and other elements of a person’s background are an important part of who they are, he said. 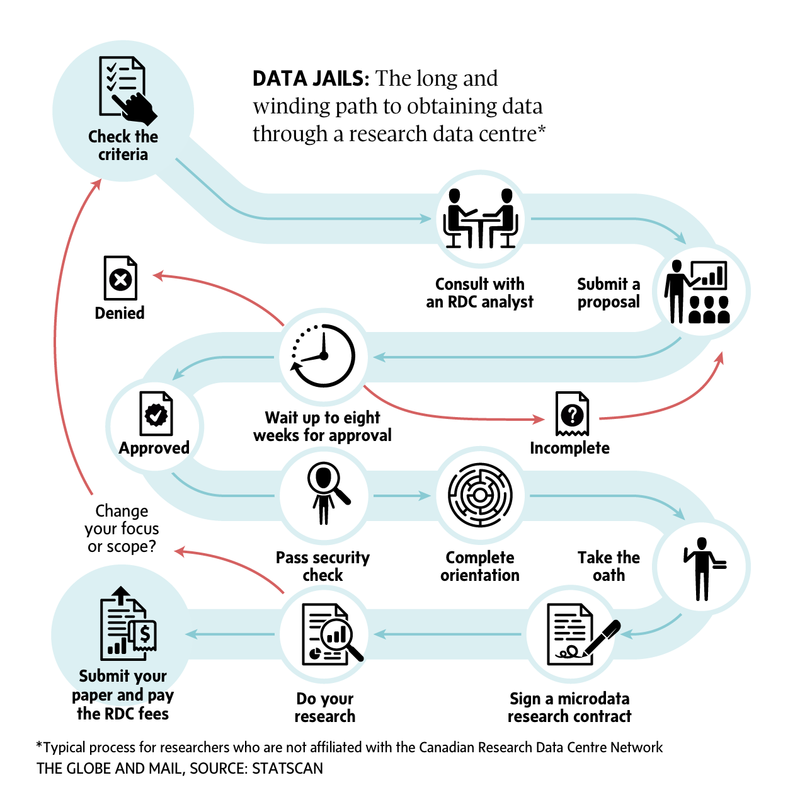 As a reasonably heavy user of IRCC data, that released on Open Data as well as specific requests, I understand and appreciate both the cost recovery (takes time and resources) and public interest aspects (data helps inform discussion and debate). But $30 per additional minute of search time? Hard to justify on cost recovery given it is only staff time that should be counted: $100 for the first 10 minutes and $30 per minute thereafter is $1,600 per hour! The federal immigration ministry is asking up to $30 per minute to process a public request for immigration data, despite the Liberal government’s directive last year to waive extra fees for access to information requests and commitment to making government information open by default. One advocate of government transparency said the $30-per-minute proposed charge thwarts the intent of Treasury Board President Scott Brison’s fee-waiving directive, and another said such fees could work as a “deterrent” to members of the public looking for government information. The request related to information that factored into a change in the government’s visa policy that allowed the passage of Canada’s trade deal with Europe. Immigration, Refugees, and Citizenship Canada officials initially declined to make public the rate at which visa applications from Bulgaria and Romania were refused, unless the requester—The Hill Times—agreed to pay $100 for a 10-minute search of the department’s records, plus $30 for each additional minute it would take IRCC employees to find the data. Mr. Brison (Kings-Hants, N.S.) instructed all government entities last year to waive fees associated with access to information requests—used by businesses, media, and the general public to obtain government information—beyond an initial $5 filing fee, as part of the government’s transparency platform. The Hill Times used the Access to Information Act to request the most recent three-year visa refusal rate for Romania, Bulgaria, and Mexico, countries for which the Liberal government has scrapped or has pledged to scrap visa requirements since it came to power in 2015. The government has been criticized, including by the opposition Conservatives, for deciding to drop those requirements to grease the wheels of international relations, despite evidence that in the months leading up to the visa-lifting decisions none of the three countries satisfied some of the government’s formal criteria for eliminating a visa, including high rates of refused visa and asylum claims. 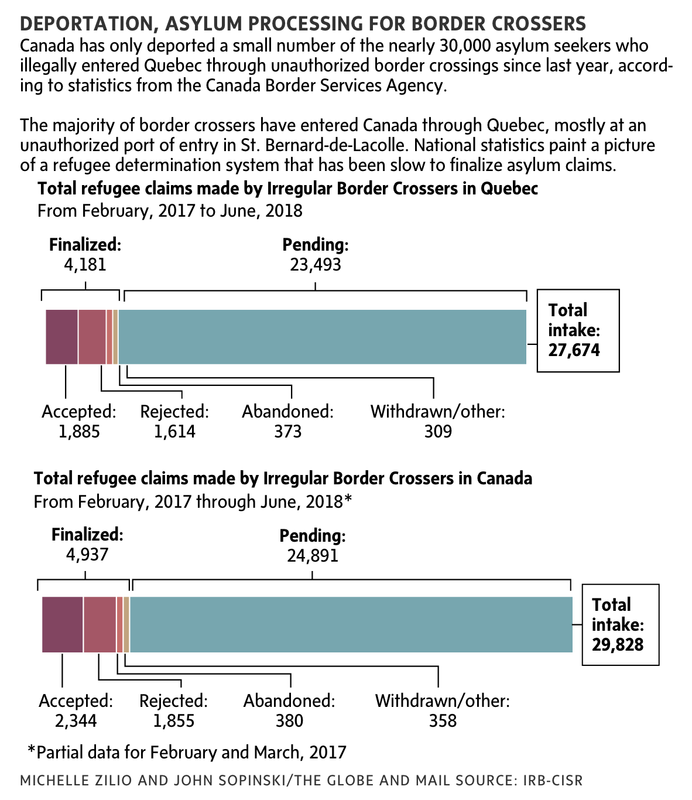 In effect, the data—which should be at the fingertips of decision makers in IRCC—was considered to fall outside of the scope of the Access to Information Act because the Immigration and Refugee Protection Regulations allow the department to charge money for data searches. “It’s obviously an illegitimate interpretation of the act,” said Toby Mendel, executive director of the Centre for Law and Democracy in Nova Scotia, and an advocate for government transparency. The Access to Information Act clause excluding material available for purchase “means material that you are selling, like a book,” not government data, said Mr. Mendel, who called it a “dishonest” interpretation of the act by the department. The three-year visa refusal rate is a key figure used by the government to decide whether or not citizens of a particular country need to apply for a visa before travelling to Canada. Canada decided last year to waive the visa requirement for Romania and Bulgaria by December 2017 as part of what is widely seen to be a quid-pro-quo for support from those two countries for supporting the Comprehensive Economic and Trade Agreement with Europe. …The fee starts at $100 for the first 10 minutes departmental employees spend searching for the requested information in their databases. After that, it increases to $30 per minute. After being initially contacted by The Hill Times on April 20, the immigration department’s media relations team promised to provide the visa refusal rate for Romania and Bulgaria and respond to a series of questions about the fees charged under the Immigration and Refugee Protection Regulations in relation to requests under the Access to Information Act. The department had not responded by filing deadline May 2. “Data allows you to know what is the scope of the problem you’re trying to solve, or is there a problem that actually needs solving, and to measure how you’re doing and if [your policy] is working,” said the senior Liberal official. If all that data is made public, it could also foster a better policy debate. The signature first act of Trudeau’s government was to restore the mandatory long-form census, the cancellation of which galvanized concerns about the former Conservative government’s approach to evidence and policy. The rest of their agenda in this regard remains a work in progress. A chief science adviser has not yet been appointed. Still pending are improvements to the annual reporting on the performance of government programs and reform of the estimates process, through which Parliament approves the government’s spending plans. New legislation for the parliamentary budget officer has been panned as too weak and restrictive. Liberals nonetheless express interest in focusing on outcomes, not inputs: on what is accomplished with public money, not just what is spent. More information about what’s happening in and around the areas touched by public policy would help with that. “Collecting the data is the first step in making policies that are informed by evidence and, even more importantly, actually evaluating public policies to see if they are doing what we hoped they would,” said Katie Gibbs, executive director of the group Evidence for Democracy.